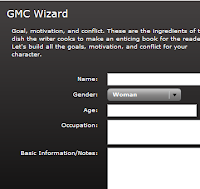 Web Developer by Day, Mad Typist by Night: Meet the GMC Wizard! Instructions: From the first screen you enter basic information about your character that you may want to reference later if you plan to print out the results. After you enter basic information (if you like), you move on to the External GMC screen. Now you will build you goal-motivation-conflict statement. You start with the goal. Then the motivation for that goal and then finally the conflict that will hinder that goal from coming to past. The next screen is for the Internal GMC. You'll do the same steps. From there you'll work on the external GMC to the internal GMC. You can work on two sets GMC statements (internal and external) at a time. Once you are done you can print the results for later if you like. When you press the View Printable Grid you will be taken to a new window with the grids that you can print. GMC-O-Matic - For those times when you just need a sample GMC period. 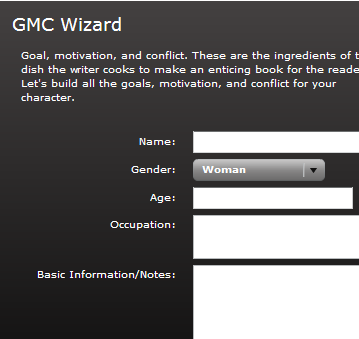 Additional Slots so I can build GMCs for chapters and scenes. Suggestions? Send them my way. I created this to hold my hand while I plan my books so I hope it helps someone else. Really cool, Shawntelle! I'm going to try using it for my WIP. AWESOME! You are a genious!!! Srsly. And also, I feel terrible. My google reader kicked your blog out for some reason - I was wondering why you hadn't posted in awhile. Looks like I have a lot of great reading to catch up on! Thanks Shawntelle! I'm about to start a new novel and this will be a big help. This is so cool, congrats. Really cool, Shawntelle! Thanks for sharing this w/ us! 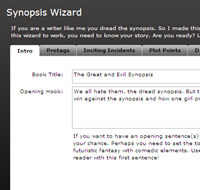 I just used this to help me get started on my character descriptions and cover blurb and it is AWESOME!!! Thanks so much for developing this and sharing it with us! i really enjoyed this. it rocks, thanks for sharing. This is beyond awesome. Thanks so much for sharing your mad skillz with us! You are da bomb. Definitely linking to your site! This helped TREMENDOUSLY!!!! Wow Shawntelle - this is so cool! As a web developer and a writer I'm very impressed. 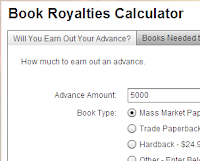 This is the first time since I first heard of GMC at the 2004 RWA that I've completed the fields and it made sense. Thank you so much for creating this!